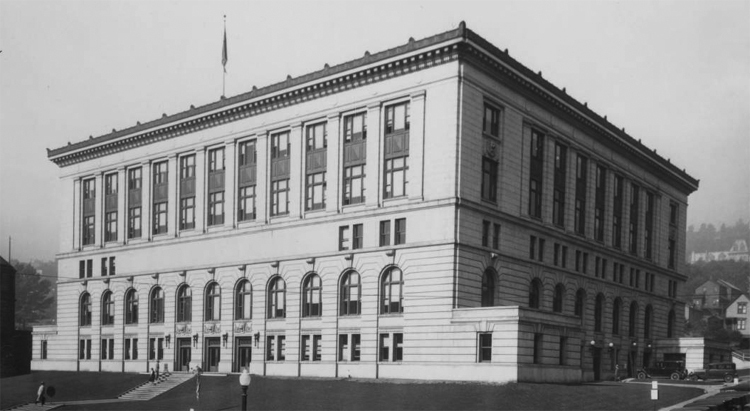 Calls for a new city hall in Duluth began upon the announcement that the “Burnham Plan” for a “civic center” of buildings had been accepted in 1908. Although St. Louis County had hired Daniel Burnham to design its county courthouse, his civic center idea placed the courthouse within a larger design, flanked by a new city hall and federal building. So for the county’s plan to work, the city and the federal government both had to agree that they would, eventually, construct buildings of similar design to the neoclassical courthouse on the locations established by the plan. The 1892 Federal Building, first occupied in 1894, was only 14 years old, and the government was in no hurry to replace it. City Hall was a completely different story, and it would take Duluth 17 years after the plan was accepted to break ground on its part of the bargain. So the issue sat idle until early 1922, when the idea came up in the city council’s agenda once again. In a heated debate in the city council chambers of the old city hall, commissioners discussed Finance Commissioner Leonidas Merritt’s new ordinance to start issuing bonds to get construction started. Merritt, of Duluth’s famed pioneer family, said of old city hall, “this hog hole is not fit to do business in!” Mayor Snively pointed out that issuing Bonds meant the city would be obligated to begin work, and it didn’t even have a plan. Despite the seemingly divided council, Merritt’s ordinance passed unanimously the next month. By the end of March local papers reported that the city had retained local architect Frederick German to draw up plans for a building that would conform to the Burnham Plan. Commissioner P. G. Phillips warned the council they were moving too fast, but his concerns were ignored. Commissioner Bert Farrell scoffed at Phillips, retorting, “You don’t know what you are going to do at all without an architect. Let the citizens of Duluth criticize the architect’s plan.” In April, German and his partner Leif Jennsen were hired as the project’s architects. The project continued to crawl forward. German & Jennsen presented preliminary plans in November 1922. Contractors were eager to get at the bidding process, but the city kept presenting the architects with different usage plans: first the building was to include a municipal jail, and then maybe not. Perhaps it could be one less floor high. By the fall of 1924, German & Jennsen still had not come up with a plan the commissioners could accept. On October 27, the council adopted a resolution to accept the latest plan with some revisions. A week later, after the architects failed to present revisions, the Council passed another resolution, this one to withhold approval until it receives those revisions. It gave the architects until November 12 to comply. For whatever reason, German & Jennsen never submitted revised plans. Meanwhile, another controversy erupted: Why build a grand marble-and-granite monument when a simple office building would do, likely at half the cost? And does it really need to go along with the Burnham Plan? After all, his neoclassical courthouse was already considered “outdated” by architectural standards. And shouldn’t we wait until Duluth, inevitably, reaches its estimated future population of 250,000 to 500,000 people? By June of 1925 Finance Commissioner W. S. McCormick, had replaced Leonida Merritt after the great pioneer passed away, was calling for an eight-story modern office building at the southwest corner of Superior Street and Second Avenue East—the site of the 1889 city hall and 1890 police headquarters and jail—that could handle all of the city’s business for decades to come. And it would cost half as much as the German & Jennsen design. Despite the support of Mayor Snively and the News Tribune, the idea never gained footing. In fact, in September 1925—after a petition circulated calling for a city hall within the Burnham Plan—populist Mayor Snively bowed to constituents and put forward a resolution to get moving on a neoclassical city hall at the site purchased from the county for just that purpose. It passed with one dissenting vote: Commissioner Bert Wheeler voted against it “just to “prevent it from passing unanimously.” As far as the county’s civic center plan was concerned, Duluth held up its part of the bargain, first struck in 1908.